Matt, there was really no way to give you a heads up that your brother was now in on our dirty little secret. I just couldn’t keep up the lies anymore. I was so beat down by your behavior that I told him for me. I am not a liar and it was very hard for me to continue to make up stories to your brother. He’s a very smart man and it was only a matter of time before he figured it out. I felt he needed the whole truth before he signed up for the ride of his life. I witnessed your ugliness when it came to your precious pills but he still thought you were his charming little brother. The meeting was days away. I went from being excited at the thought of seeing you clean to being a shaking mess at the thought of your reaction to both me and your brother showing up. I had no experience in the world of rehabs and had no idea if you were even aware of this upcoming event. No communication was their rule and I wasn’t about to stir the pot if it meant getting you healthy. Mike and I talked several times before the meeting trying to come up with our plan on how to approach your situation. We were going to present a united front. I tried to prepare him for the Matt that took up residence in your body, but until you witnessed the behavior first hand it was hard to imagine. I knew the power of the demons, he was about to find out. Meadow Wood presents itself as a Behavioral Health System. Like I said, I had no idea what to expect. I spent my years in the NICU and had no idea how they would treat addiction. I tried to educate myself about the services they offered. Qualified clinicians providing services 24/7. Psychotherapies both individual and group were offered. Family education, after care and discharge planning. The more I read the more upbeat I became. Finally there was hope that you would get and stay clean. I prayed you would be there until you were strong enough physically and mentally to fight the poison your body craved to live. Matt, the day is finally here. I am shaking and sweating. It’s a crisp, sunny perfect fall day. I took that as a sign today would go as I planned. You, me and Mike all united in the fight. Supporting you in your recovery. Mike was meeting me in the parking lot. I arrive and he’s waiting in his truck. Hey Mom, you ready for this. I’m as ready as I’m going to be. Hey Mike, be kind. He’s been through so much already. He’s probably going to be embarrassed that you know what’s been going on. Mom, I’ll handle it, don’t tell me how to feel. Sorry, you’re right. This is between you and Matt. I felt a cold chill run through my body. My mind warning me to hold on. The roller coaster was just getting ready to take off. Matt, the look on your face sucked the breath out of my lungs. I don’t know what I expected but the look that greeted me was full of hate. First, you see me, then Mike. The tension in the room is stifling. Your counselor looks like she just finished preschool. She had no clue as to how manipulative you have become. She has no clue that you have learned how to play this game. You know what to say and how to say it. I sit and listen to how you have been the victim. How hard I’ve made your life. I can’t even look at your face. I want to click my magic heels and return to Kansas. Any where but here. I can feel the anger building in Mike. I keep giving him the look. Oh God, please this room is about to explode. Your brother has heard enough. I close my eyes and will myself to disappear. I listen as he retells our story and calls you out on everything you have put me through. Your counselor looks like the rabbit in Alice in Wonderland, looking for the magic hole to slide down. I want to follow and never return. You sit in your chair. Squirming like you did in school when I had to meet you in the principal’s office. Oh God, I am silent as you and Mike go head to head. I can’t even speak. My mind is saying get up and run for your life. Your counselor is no way prepared for the wrath of your older brother. I wasn’t prepared for the anger spewing from Mike. I try to speak but can’t find the words to fix this. My boys at each other. Your addiction has taken another victim. You have learned nothing in the week you have spent away. Your cockiness shining through with every word you speak. It’s your life. Your responses blow my mind. Never in a million years did I ever expect this. The meeting full of ugliness and accusations. How do we go on from here. Mike and I walk out together. I try to stop the sobs that are forming in my throat. I feel so defeated. Mike, I try to talk but the words won’t come. Mom, I just can’t believe he sat there like he’s the victim. Like he’s done nothing wrong. Who the hell does he think he is. I try to explain that it’s not you. 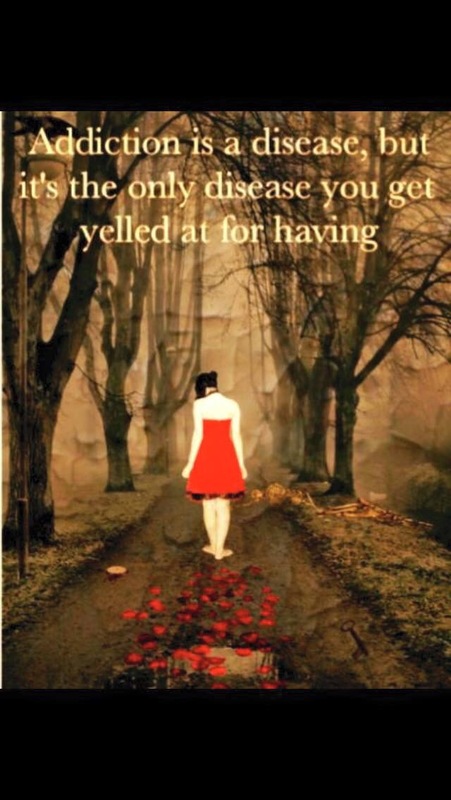 It’s the disease. I tell Mike that I know his anger. I lived with anger blaming you for this chaos that took over our lives. Until I saw first hand the horror of detox. I’ve had glimpses of the old Matt before the demons. My education in addiction has been ongoing. Mike is new to the craziness that has become a way of life for me. Mike, we have to work together, we can’t tear each other apart. Matt is sick. He needs help. I didn’t bring you on board to fight. Mom, I’m sorry. I just couldn’t believe how he sat there and played that girl. If these people are the experts then we are in for a hell of a ride. We hug as you walk me to my car. I watch you pull away. I sit in the dark and let my emotions loose. The sobs rack my body. I try to get control but have no power over the tears. That familiar feeling of hopelessness returns. I can’t believe a family meeting tore our family apart. My two boys, once so close now so far apart. I closed my eyes and relived the destruction of our lives. I wondered how these so called professionals could be so blind to your cleverness. Your demons outwitting the people I counted on for help. I didn’t realize it that night but your brothers words rang true. The experts were blind and we were in for one hell of a ride. Hey Mom, What’s Up With Matt….